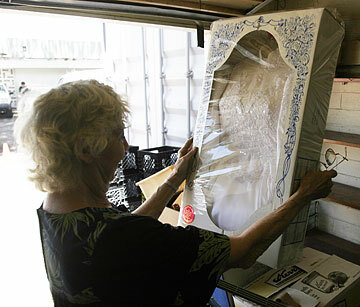 Bev Ashford, a volunteer at the KCAA thrift store in Moiliili, holds up a wedding dress that is for sale. The store's building has been deemed unsafe, and anyone entering must wear a hard hat. The store has been there since 1962. THE volunteers at the KCAA Thrift Shop in Moiliili are feeling a bit like displaced family members. For 44 years, they have been important in the lives of many. Bev Ashford, a volunteer for 40 years, particularly remembers one couple who made weekly visits. "They were an elderly couple. Each week, they would come in and he would buy her an inexpensive piece of jewelry. When she became ill, he would come by himself and still pick something out." Place: KCAA Mother Rice Pre-School grounds, 2707 S. King St. Even after the man's wife died, he would visit to talk story, she said. "Sometimes people just need someone to listen." The shop closed last week, its building deemed unsafe and uninsurable, Ashford said. It has yet to find a new location. "We are all anxious to find a new spot," she said. "We just don't want to quit. So many people truly depend on us." The shop would have to operate under a charitable agency, because funds for rent are limited. Thrift-shop profits provide tuition assistance for the KCAA Pre-Schools. The new location would also need to be accessible by bus. "Lots of people come on the bus, they don't have cars," Ashford said. In the meantime, the volunteers are offering a final "Aloha and Mahalo" sale this Saturday, with bags of goods to be sold for $4, $5 and $6 from 9 a.m. to 2 p.m. on the grounds of KCAA Mother Rice Pre-School in Moiliili. Customers can fill the bags to the brim with clothes, shoes, linens, toys, books, housewares and more, said Ashford. Furniture and other items that won't fit in the bags will be sold at half price. And a boutique will offer an array of normal-priced items. Margaret Privat, a Canadian resident, volunteered at the shop for six years during her six-month stays in Hawaii. "Customers would invite me to lunch," she said. "I've made lots of friends through this job." Margaret Yamane is not on the front lines, but is just as attached to the shop. She was responsible for sorting and pricing items. One year, she took all of the bunnies and Easter decorations home and made dozens of Easter baskets. "I also made arrangements with the fake flowers," she said. The Asian sale was among her favorites, though. "Opening day of the New Year was the most wonderful day. People would stand in line, waiting to get in. We had all different items, Chinese, Japanese," said Yamane. The sale was scheduled around mid-January, and had a variety of Asian and Pacific Rim items including scrolls, vases, tea sets, statues and decorative motif. Fred Gartley, a volunteer for 20 years, said customers would sometimes request specific items. "Sooner or later it would show up here," he said, adding, "I'm wondering what to do on Monday." KCAA Pre-Schools was established in 1895 and known as the Free Kindergarten and Children's Aid Association of the Hawaiian Islands. At first, Kindergarten classes were organized by ethnic groups -- Chinese, Japanese, Hawaiian, Portuguese and foreign. The thrift shop was started by Ann and Jack Simpson to help with tuition aid. The volunteers and customers are not the only ones who will feel the impact of the closure. The schools serve about 900 children each year, according to Christina Cox, president of the preschools. One-third of the children are from low-income families, their tuition subsidized by the state. However, the state offers incentives that will help make up for the funds lost from the closing of the thrift shop. "We will feel the loss in terms of a balance of generations," Cox said. "These volunteers have worked with the children in mind and on behalf of the children." Cox has been trying to find other places for the volunteers. "These folks have such a camaraderie amongst themselves," she added. "Hopefully, they can keep their friendships and give back to another community."